Her vision was simple: build a wall, paint it with chalkboard paint, ask passersby to register what they wish they had the courage to do. The response has been inspiring. I’m used to Nancy Belmont, who also happens to be my best friend, finding the essence of the human spirit in every person, place, moment. 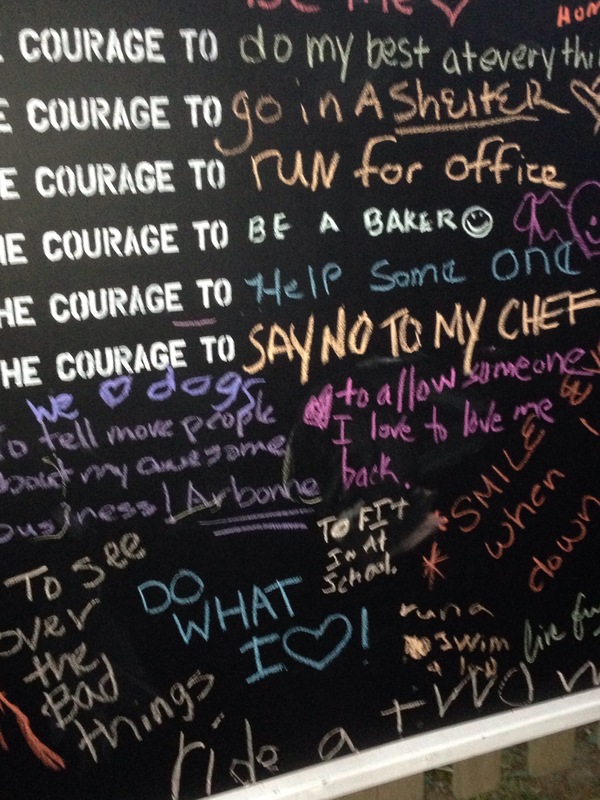 In that regard, I’m not surprised at the overwhelming response to the Courage Wall she built on Mt. Vernon Avenue in the Del Ray neighborhood of Alexandria, Virginia. But yet, I am surprised. I may write a blog where I often confess my greatest personal challenges, but I’m a private person by nature. The interwebs provide a firewall, a degree of separation between my writing and the reader. I can make confessions in this medium I wouldn’t make in real life. I can do this because if I touch one person, it’s worth any angst I suffered getting the words out. I wish I had the courage to refer to myself as a writer and not as an aspiring writer. I wish I had the courage to open my heart to love. I wish I had the courage to do a head stand. I wish I had the courage to not be a bully. I wish I had the courage to let go. Or my younger son’s tear-inducing entry: I wish I had the courage to fit in at school. It’s a big deal to spell out in pastel chalk that which holds you back. And I hope every person who dares to reveal a piece of his or herself finds peace and can take the first steps toward acquiring the needed courage to move forward confidently. I want Nancy to realize the extent to which she touched the lives of a community. 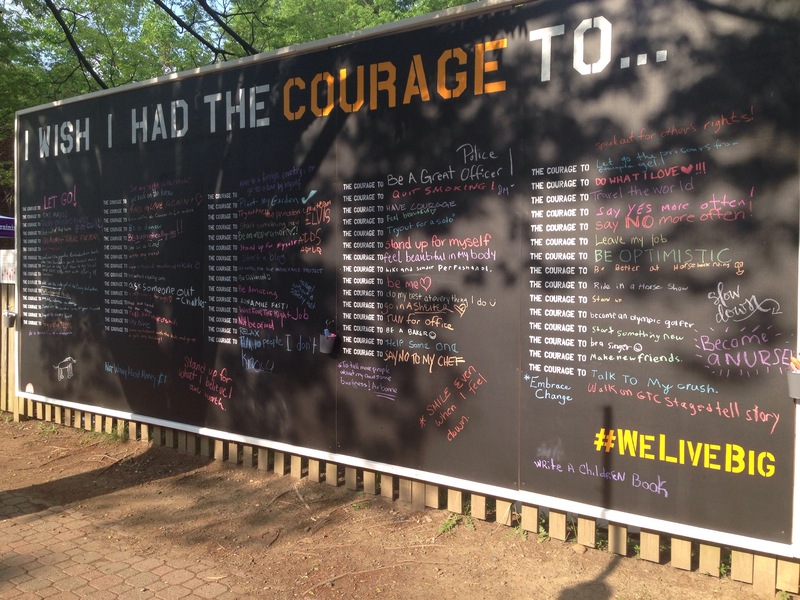 We will not be able to measure how many people used the wall as a first step toward perusing their greatest desire but I can confidently declare the Courage Wall to be just the conversation piece many of us need. Thank you to all those who shared. Thank you, Nancy, for having the courage to follow through with your vision. Your courage begets our courage. And as a result, we live big.